I was up bright and early on Sunday morning. I “enjoyed” the breakfast in the hostel bar while waiting for the other members of our intrepid expedition to filter through, “enjoy” their breakfasts, and begin to draft our plan of attack. We eventually settled on starting our day by touring Edinburgh Castle. 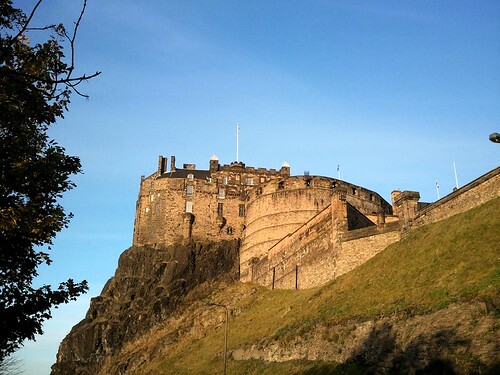 To say that Edinburgh Castle dominates the Edinburgh skyline is a gross understatement. The castle looms over the old town, a comforting landmark and constant reminder of the sense of history that pervades the city. It is everything one wants from a stereotypical fortification. Perched precariously atop the Castle Rock, it looks almost as if it grew from the cliff. It’s possible to walk around the outside of the castle and view the sheer cliff face along one side—our guide during the previous day’s walking tour had told us it was easy to climb if one knew the right path, but I had no desire to test that theory! Fortunately, the approach from the Royal Mile is less daunting and more paved. Being sick really throws off my routine. And I love my routine. I had planned to write one or two more posts about my Scotland trip. But I’m behind, because since last Thursday I have been ill with some kind of chest cold that has since metamorphosed into a head cold. I am feeling better relative to Thursday and Saturday but am still under the weather. I took my first sick day on Tuesday, and I returned today to avoid the compounded chaos of a second day of supply teachers. I don’t regret this decision—I think I did some good—but it was definitely a difficult day. I finally have some ginger ale and Sudafed, though, which helps. Sickness does not necessitate silence, though, so here I am! Hi. Also behind on book reviews, even though I am still reading quite a bit. I look forward to Christmas break not just because I am happy to visit home but also because I might finally have enough time to get back on my feet, digitally speaking, and stay there for most of next term! Let’s hope. Anyway, I’m going to relax for a bit now and then go to sleep. This past week was half-term, a welcome break for students and teachers alike. I elected to join a large group of fellow teachers (all of us Canadian except for an odd Aussie out) in a visit to Edinburgh, Scotland for the first four days. We all sort of filtered into Edinburgh Friday night/Saturday morning. I took the same train as another teacher; we went to Peterborough directly from Thetford, and then boarded our train to Edinburgh. The train was so crowded that I had to stand for the first hour! As we got further north, however, seats opened up as people left at the stops along the way. By the time we reached Edinburgh—four hours later—we virtually had the coach to ourselves. I discovered I could charge my phone at my seat … fifteen minutes before we reached Edinburgh station.